"Treating skin diseases with hypnosis (hypnodermatology) has performed well in treating warts, psoriasis, and atopic dermatitis." Seriously though, when I was in massage school I recall learning specific techniques that were said to be helpful, however I never had a psoriatic patient so I had no opportunity to use them. I developed psoriasis in the scalp in 2013. I was referred by my doctor to a specialist. The specialist confirmed the diagnosis and basically said I would have to live with it for the rest of my life. He prescribed some chemicals to treat it with, which would have had long term adverse health effects. While researching the topic I came across this clinic: http://psoriasiseczema.com.au. The founder is a research scientist who originally developed a treatment to help a friend. I met with their naturopath, who recommended dietary changes along with some remedies. Six weeks later the psoriasis had all but disappeared and has not returned. It's a long away from you (hopefully they would do a Skype consultation) and there would definitely be costs in the remedies and postage, but I understand their treatment is very effective for most people. Could this be caused by provocation? Some find a change in diet helps. Malcolm could tell you more. I was going to ask Malcom about thus very thing. My wife told me its related to gut and just do a fast. I only know what I have read..but I know that there is a theory that it is caused, or at least worsened, by inflammation of the gut. And that dietary measures can help. What will work depends on what is causing it. Almost everybody that has been cured will quote a different treatment. Have you tried pine or birch tar soap? It works really well for other skin conditions. Buy the proper stuff from a Baltic country. The EU produced stuff (like Wright's Coal Tar Soap) doesn't even use coal tar, because they decided that it is harmful. I have an incredibly sensitive scalp and even the most natural of shampoo made me break out in itchy spots and and dandruff. Hell, even rain caused problems. The constant scratching was causing my hair to fall out too. After I started using birch tar soap the itching, dandruff and spots stopped completely and my hair started to grow back too. I wonder if i can find that in the states. What are the ingredients? I do a lot of Odzer Chenma practice. It is very dark and cold where I live so its hard to get enough sunshine. You can order it from ebay or amazon. The particular brand contains: Sodium Tallowate, Sodium Cocoate, Sodium Palmate, Aqua, Glycerin, Betula Tar, Titanium Dioxide, Triethanolamine, PEG-9, Disodium EDTA, Citric Acid, Cellulose Gum, Benzoic Acid, Sodium Chloride. There are other more naturally produced tar-soaps. This is helpful, thank you. Mine is also a scalp problem. It's not badly flared up at the moment, and I'd like to keep it that way. I have the same problem with many commercial soaps and detergents. I have to be careful what I wash my clothes with. Luckily I seem to be less sensitive to these than I was when I was younger. This is the only benefit to aging I know of. I hope you get some relief too. Coal tar is unpleasant to use but it did the job (after six months) to get rid of the flare-up on my scalp. We can get it easily here in the states because it's legal to use as baby formula here. I'll investigate the pine tar. Is it turpentine's brother, or turpentine's cousin? What's the name of this in English? Afterward, the researcher told me that some people are basically unhypnotizable, and I am one. 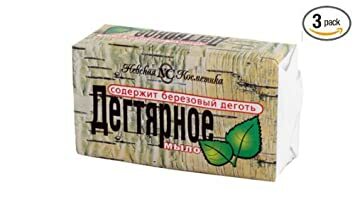 Do a search for pine tar soap. That's how I find it on ebay. Cousin. Turpentine is made from pine sap (they harvest it here on the island). Pine tar is what you get when you burn pine wood slowly. It forms when the smoke condenses on the inside of chimney tubes.